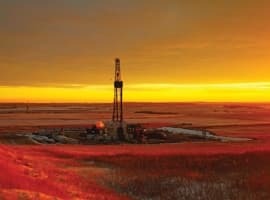 Is Oil Demand Growth Overrated? Organic demand or population growth alone (absent surging debt) among the consumer base that consumes in excess of 90% of global oil, is collapsing. I have detailed this previously; The Most Important Economic Charts...Aren't Economic Charts , Trade Wars Just Beginning...The War Is a Fight Over an Indefinitely Shrinking Pie , and Global Growth in Energy Consumption (& Economic Growth) is All About China...Nothing but China ). This article focuses solely on the demand side of oil (but the situation is similar for most commodities or assets for that matter) and details the decelerating number of potential consumers versus forecasts of continued trend growth in consumption. However, I make no predictions regarding the oil price outlook as there are far too many other factors regarding; supply, currencies, geo-politics, cap-ex for exploration, depletion rates of existing fields, and far more. My sole focus and point is that growth in demand is fast waning but that price is an amalgam of demand with many other factors that may result in a rising price despite declining and soon to be falling organic demand. Two regions of the world represent nearly all population growth but consume relatively small quantities of oil. I have grouped Africa and S. Asia (India, Pakistan, Afghanistan, Nepal, Bhutan, Sri Lanka, Bangladesh) as a single unit versus the remainder of the world. These two regions are collectively slightly more than 40% of the total world population but consume just under 10% of the world oil output. Neither Africa nor S. Asia have the relative income, savings, nor access to credit to consume anywhere near the levels seen in most of the rest of the world. Given they are currently relatively minor consumers, even a relatively high rate of growth will not offset the decelerations and declines among the vast majority of oil consumers elsewhere. This means we can focus on the 60% of the world population that consume 90%+ of the global oil output. 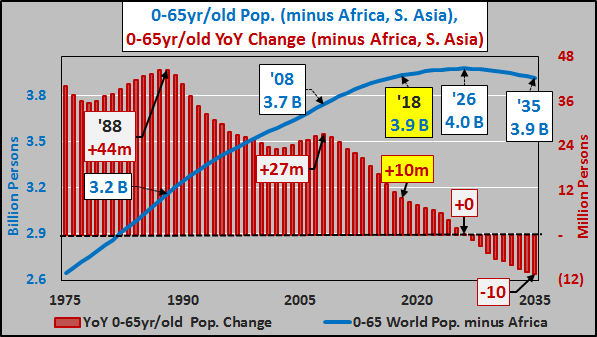 The chart below shows the total under 65 year old population excluding Africa/S. Asia (blue line) and the annual change (red columns). Growth among this cadre continues decelerating and by about 2026 will begin declining for an indefinite period. The chart below shows the cumulative growth per five years of the consuming population versus the global growth in oil consumption from 1985 through 2020 and estimates (dashed circle) through 2035. 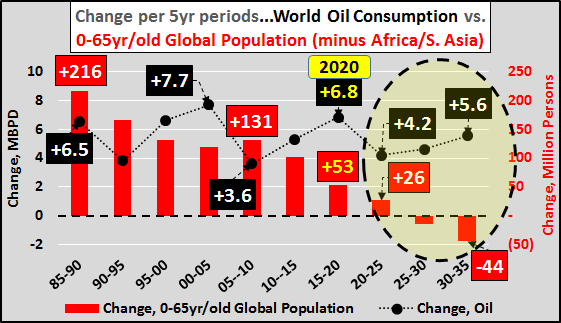 While the growth of the under 65 year old global consumer base has slowed 75% from peak growth in the late eighties compared to the current '15-'20 period, the growth in oil consumption has been relatively consistent over the same period. This has been achieved by the concurrent cheapening of interest rates to incent massive increases in personal, corporate, and governmental debt. This substitution of higher debt and leverage for slowing organic growth has artificially maintained a higher growth rate than otherwise organically possible. Some will suggest the surging 65+ year old population will offset the soon to be declining under 65 year old population. However, as the chart below shows, US (and worldwide) household income / spending significantly decline as the head of household ages. Peak income and spending takes place around 50 years old. 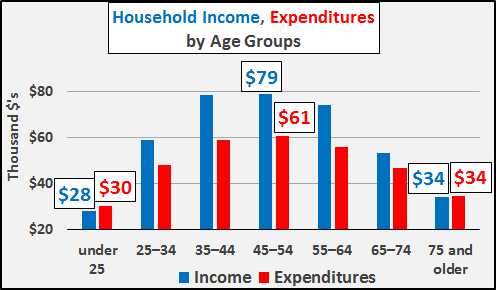 By age 75, both earnings and spending fall in half and this group is highly credit averse (little to no multiplier absent the willingness to "charge it"). So, while there is some marginal growth that should be expected from the surge in 65+ year olds, it is relatively weak. Simply put, even with continued ludicrous levels of debt creation and misallocation taking place, I'll take the under against the EIA's forecast for continued trend growth of global oil consumption...way under. But again, this does not necessarily mean the price of oil in dollars or Yuan or Euros will be declining as there are far too many other factors which are simultaneously affecting supply or the value of "money" and what backs them (Near Record Treasury Issuance... 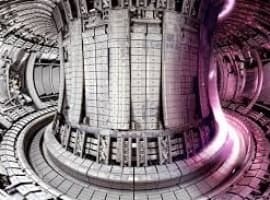 But Who The Buyers Are May Surprise). Right now their is plenty of oil supply to meet oil demand. The problem is too much supply, which is why OPEC/Russia keep idling capacity to balance the market. Even with Venezuela's production dropping like a rock, and other issue around the world, they still have to limit supply, even with growing demand, as production in the USA surges, and will continue to surge with WTI over $60, and now over $65. 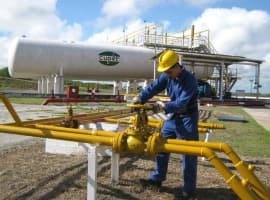 The USA isn't the only country finding and producing more oil & gas. However, let the OPEC/Russia restrict supply artificially. The longer the price stays this high or higher the more time the U.S. and some others have to get their oil out of the ground and a big profit, and the more of a window it gives renewables to stay competitive and continue to lower their costs. Oil & Gas at no longer scarce resources so artificially idling capacity to raise prices sooner or later will blow up in their faces. In the meantime its great for U.S. producers of oil, gas, and renewables.